Greater Sydney has grown from the home of Aboriginal peoples to an internationally significant economic metropolis. In the past 25 years, it has grown by 1.3 million to reach 4.7 million people (refer to Figure 3). Its evolution, through population growth, urbanisation and technological advances, can be traced through eight major planning strategies since 1909. A Metropolis of Three Cities represents another quantum shift in driving Greater Sydney’s future as a successful economy and one of the world’s most beautiful and liveable places. In looking to the future, many of the lessons of the past remain relevant today. Rapid population growth in Greater Sydney by the turn of the 20th century, led to the 1909 Royal Commission for the Improvement of the City of Sydney and its Suburbs. Its emphasis was on providing basic sanitation and improved living standards for the working class, and to beautify the city. At the time, growth followed the tram and rail corridors. The 1948 County of Cumberland Plan moved families from inner-city slums to the west, along new rail lines radiating from what is now the Eastern Harbour City, and established the first green belt. Post-war immigration, the baby boom and falling household occupancy rates were addressed in the 1968 Sydney Region Outline Plan which promoted new centres within the metropolitan area, each planned for growth along road and rail corridors. It embraced connections to Newcastle and Wollongong and had a stronger focus on the areas this Plan refers to as the Central River and Western Parkland cities. Four subsequent plans – Sydney into its Third Century (1988), Cities for the 21st Century (1995), City of Cities (2005) and A Plan for a Growing Sydney (2014), differed from the earlier plans by focusing on economic issues, as well as the physical form of growing a polycentric city and urban renewal. The 1988 Plan was designed in collaboration with a transport strategy and was the first to recommend higher development densities in established and greenfield areas, a policy that continues to evolve, and saw development densities in greenfield areas increase from eight lots per hectare in 1988 to close to 20 lots per hectare today. The 1988 plan included a new airport in Greater Sydney’s West, reinstated in the 2014 plan, and was the first to introduce sub-regional (district) planning together with a strong focus on urban design. 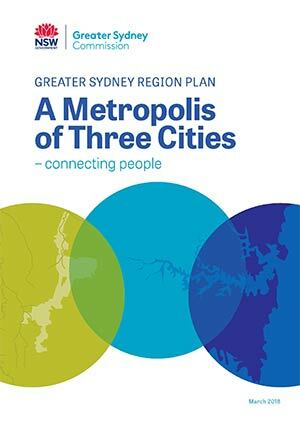 The 2005 and 2014 plans continued to refine the framework of Greater Sydney as a series of sub-regions and promote the role of centres across Greater Sydney. Greater Sydney’s most pressing challenge today is to address population growth and demographic change, while improving liveability. For most of the 20th century, Greater Sydney’s population grew at an annual rate of around 2.5 per cent (refer to Figure 4). 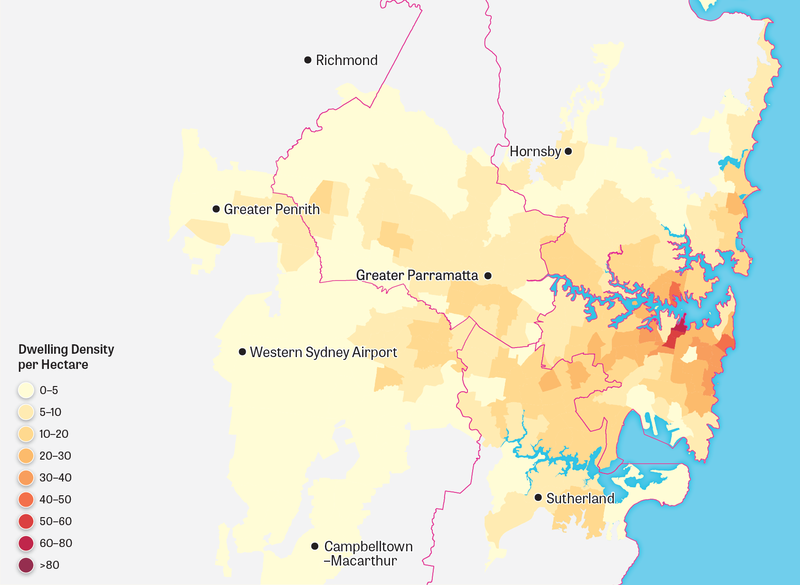 Today, Greater Sydney is one of the top 10 fastest-growing regions in the Western world and by 2036 is projected to be home to another 1.7 million people, or 3.2 million more people by 2056. Greater Sydney’s footprint has grown not only through an increasing population, but a decline in dwelling occupancy rates; down from 5.24 and 6.08 people per dwelling in 1909 (depending on whether the resident lived in the suburbs or the city) to an average of 2.8 in 2016. Density has declined from 13 people per hectare in 1909 to an average of 4.25 people per hectare across Greater Sydney. While there are 31 people per hectare in the Eastern Harbour City, this is low compared to an average density of 109 per hectare across New York City (the five boroughs). In addition, Greater Sydney is currently seeing a higher number of births, with around 63,500 births each year. At the other end of the spectrum, the proportion of over-85s will almost triple in the next 25 years. These two statistics alone generate the need for greater housing choice and affordability as well as community facilities from baby health care, child care and schools, to support services for older people. Greater Sydney’s housing market today is recognised as one of the most expensive in the world with median detached dwelling prices exceeding $1 million and reaching 10.5 times the median annual household income. This is driving a change in expectations from the quarter-acre block (about 1,000 square metres) of the 1948 and 1968 plans to smaller lots with compact and innovative forms of housing. The Eastern Harbour and Central River cities are increasingly attractive for inner-city living, with higher densities bringing greater vibrancy, reduced travel times and economic opportunities. While the 1909 Commission sought to improve equity and living standards for workers by moving them to suburban areas along transit corridors, today more opportunities for people to live closer to their jobs are needed: more affordable homes and better access to educational opportunities in each of the three cities. Approaches to connecting the city have also changed and, arguably, have come full circle since the 1909 Commission found: “The only effective method of dealing with this rapidly growing traffic lies in the construction of the City and Suburban railway systems” (refer to Figure 5). Today, rail systems need to be expanded to better serve the three cities, particularly the Western Parkland and Central River cities, and ways need to be found to accommodate new travel modes and technologies such as drones, electric and autonomous vehicles. Just as in 1948, when Greater Sydney was challenged to provide sewerage, public transport, schools or nearby jobs for the rapidly growing city, providing infrastructure remains a challenge today. Development needs to be sequenced so that adequate infrastructure can be funded and delivered. The growth of Greater Parramatta as a Central Business District was first mooted by the 1968 plan, reinforced in the 1988 plan and confirmed by the 2005 plan and is now the focus of the Central River City. Together with the emergence of the Western Parkland City and the reinforcement of the Eastern Harbour City, Greater Sydney will become a more equitable and connected city that makes the most effective use of its infrastructure. 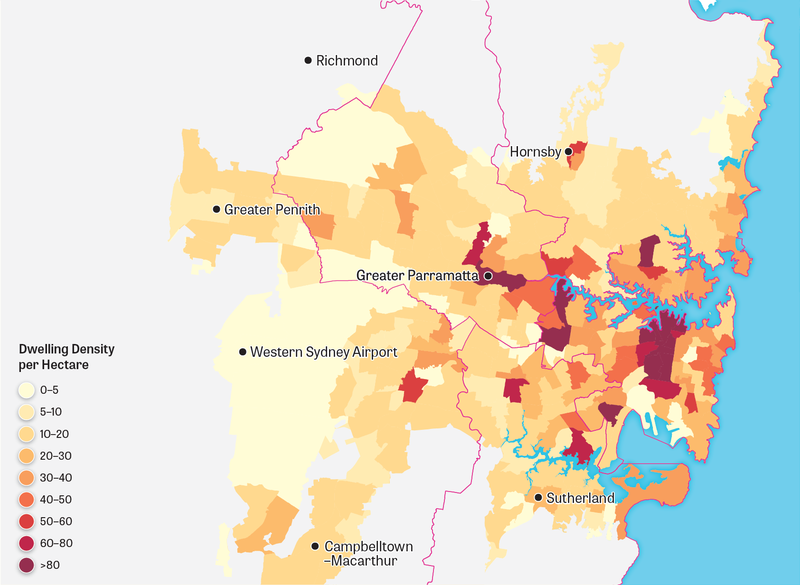 A polycentric city is supported by a centres policy which reinforces an objective of the 2005 plan, that close to half of all Greater Sydney’s jobs are to be in major centres. Centres across Greater Sydney need to be supported by sufficient industrial and urban services land, also consistent with the 1988, 1995 and 2005 plans. Every plan since 1909 has sought to beautify the region through good quality design and the protection of natural assets, enhancing cultural, historic and natural icons, from Sydney Harbour to the Blue Mountains and Scenic Hills, while reinforcing the quality of public spaces such as Parramatta’s Civic Square and Circular Quay. Building on the green web of 1948, the Greater Sydney Green Grid includes re-envisaging Prospect Reservoir for tourism and greater leisure activities; revitalising the waterways of the Western Parkland City around South Creek; and recognising the importance of tree canopy for visual appeal and for managing heat, particularly in the western part of the region where it can be over seven degrees hotter than in the eastern part of the region. Figure 5: Transport investment in Greater Sydney 1850–2050. Rapid technological change is inevitable, particularly around key areas of access and mobility and in creating a lower carbon future. Electric and autonomous vehicles, robotics, drones, artificial intelligence, battery storage, automation, computing speed and device connectivity will change how residents live and, in turn, the shape of the region. Technology may also increase demand for local employment hubs, or shared office spaces, to support localised production through developments such as 3D printing. There may be on-demand bus services, and the sharing of vehicles, smartphone-based bike sharing, autonomous vehicle hubs and electric charging stations. The economy may also change with a greater reliance on knowledge-intensive jobs and tertiary education, particularly in the fields of science, technology, engineering and mathematics (referred to as STEM). Already, education and healthcare are significant growth precincts. The gig economy – a labour market characterised by the prevalence of short-term contracts or freelance work as opposed to permanent jobs – may grow, potentially shifting traditional workplace and commuting patterns as a greater number of the workers are based at home. In aged care and health services, robots may increasingly take the load of routine tasks so workers can concentrate on engagement and patient care. The future will require people to adapt to climate change, to mitigate future impacts and to be more efficient with resources. Infrastructure will need to be not only resilient but adaptable to technological transformation such as renewable energy, smart energy networks, distributed energy and water systems and energy-efficient homes and buildings. Development will need to better capitalise on air rights rather than making space by expanding the urban footprint. This will not only require good quality apartment buildings and commercial towers but mixed-use buildings including schools, roof top gardens, vertical farms and innovative energy sources. While population growth, urbanisation and technologies change, many things stay the same – the importance of well-located housing, beautiful public places, efficient transport, local infrastructure and planning that is people focused. A Metropolis of Three Cities continues the strong legacy of strategic metropolitan planning. It seeks to protect what people love about Greater Sydney and safeguard opportunities for future generations.